Leaderboard - Go-Bengals.com - The Best Bengals Fan Community in the World! The biggest losers here are all of us for reading this piece of garbage. [quote name='bengalrick' date='29 August 2009 - 09:36 AM' timestamp='1251552976' post='795934'] Sois, when I'm at the age that I will get my SS, on its current course the program will be done. We could either raise taxes, reform the whole thing over again, or raise the age limits, but none of which are good clean options imo. Has it helped many people in its time? Yes it has. Has it been gutted and mistreated by politicians for a long time? Yes it has. Will I see a penny of it in my lifetime? Almost certainly not. I am not bitter about it... I have accepted that fact for a long time, but I just don't see the justification that it is successful with these facts. People living too long isn't a problem... I am personally glad for this fact, but in the context of SS it is a bad thing. That should be the end all comment that SS is not that great of a program. [/quote] It will not be done. There will be people working when you are in retirement that will pay into the pool. In fact, it may be in better shape (if you are ~30 or so) because all of the boomers should be dead. How to fix it? Raise the age to 75 at least. Back when the program started, people were only living 3 years past the start date. Now that figure is 20+ years. That is a lot of strain on the system. Social security is supposed to keep people from poverty. It's not supposed to be used by retired millionaires. As a financial planner that worked with wealthy clients, it bothered me to see these people getting those measly checks when there are poor old folks out there who are in bad financial shape. Lot's of people pay for services they don't use. I've never called the fire department, but I'm glad that I am paying into the system. If I ever need it, I'm glad they will be there. People need to realize that SS is no different. It should be a "just in case" thing, not a savings plan. Keels - Loser, it will be interesting when he'll get another top 10 talent. Bengals - Big Winner. 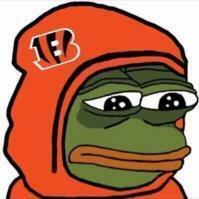 I'm sorry back in October the popular opinion was bengals needed the 1st overall or top 3 pick to get Andre Smith. They got him at 6. Paid less than 7. It cost them 30 days of practice. Totally worth it. Question - Would you rather have Jason Smith and his minor hold out along with his 62 million dollar contract with 33 gauranteed? Andre Smith - Loser with 21 mil. Think about it. If he doesn't have his minor set backs in the evaluation processs he'd have 14 million more in his pocket. Yikes. Keels will be used as an example by other agents on how things can go wrong. [quote name='Tigers Johnson' date='01 September 2009 - 09:08 AM' timestamp='1251810506' post='796826'] Recession + 4-11-1 = No sellout [/quote] Well, there are 3 teams that made the Playoffs last season that are also having trouble selling out. "Imagines a toss play to the right with Bobbie, Collins, and Andre plowing the way with Jeremi as the lead blocker"
I wish I got to know him better. Always a great fan and I pray for those he was closest to. We should beat the Broncos week 1 but they aren't in the running for the top pick. I think the defense holds them to 17 or less and our offense scores 24 or 27 with us running the ball down their throat in the 4th quarter. I'll guess Denver is a 5 or 6 win team on the season, remember they get to play the Raiders and Chiefs too. I'll be disappointed if we don't see 3 OT sets every now and then like the Raven's ran last year. Bringing Smith in, overloading one side of the line and just running the ball down peoples throats. As much catching up as he has to do, its foolish to think he can't contribute in certain spots from week 2 on. I think Andre will see time as a "blocking TE" fairly early on. My guess is he's starting after the Bye week. And while Andre's strength is his run blocking, he's not a bad pass blocker at all. He was a great poster. I hope his family is doing good still. I can't imagine going through that. [quote name='BengalBacker' date='30 August 2009 - 06:02 AM' timestamp='1251579726' post='796066'] I was just thinking about him a few days ago. I hope his wife is doing ok. [/quote] +1 on both counts. He was a great guy, and one of my favorite posters to be certain. I was just thinking about him a few days ago. I hope his wife is doing ok.
His real name was Mark Teters, and my oldest son Andrew still includes him in his "Now I lay me down to sleep" prayer every night. I hope your resting in peace man. God Bless you and your family. Who-Dey to you my friend. God bless and Godspeed. I hope his wife and Bob (his son for noobs) are doing well. I went through some of his old posts and threads using our search feature. It was great to see some of his posts and some of the old posts in general. He was a great optimist and definitely fan ... he was without a doubt an asset to this board during his time here. Hope all is well with his family. Everything on paper is pointing to the Bengals stomping the Broncs. Which is why I'm afraid of this game. [quote name='scharm' date='30 August 2009 - 04:35 PM' timestamp='1251660954' post='796350'] Regardless of your spin cycle for WDR. WDR's actions have forced focused attention of law enforcement, those actions were done because they don't like Mike Brown that's goes against the principle you stated above. Just interesting. [/quote] I don't see how complaining about Mike Brown not hiring a competent GM led to a police crackdown on the Bengals players. It's been said here that the Boone county prosecutor is a headline hunter who goes after Bengals players but how is that connected to WDR, Daugherty, or anyone else? It's just to hard to say any game is a given for the Bengals. You would think the favor is tilted towards the Bengals given the circumstances around Denver. I do worry about Denvers OLB Elvis Dumervil. Seems like the kind of guy that could give Whit some trouble. [quote name='scharm' date='31 August 2009 - 11:34 AM' timestamp='1251729268' post='796590'] IMO, if Smith forces the issue meaning he's just too good to keep on the bench. My vote would be not to mess with the tackle spots and see if Andre can be placed at LG. They are chasing the Pitt and Balt. IMO, you've got to the talent on the field even if it means rushing them from an experience stand point. Ultimately you've got to your best 5 out there. [/quote] Fair enough. I doubt whether soP will want to pay all those millions for a LG...but if you are getting production with the tackles the way they are, it would be the way to go. [quote name='Bengals1181' date='31 August 2009 - 10:40 PM' timestamp='1251769221' post='796757'] well we did go after him a few months ago, so I bet we try again. [/quote] wish we had joshua cribbs, that dude is sick! [quote name='whodey1971' date='31 August 2009 - 12:44 PM' timestamp='1251737087' post='796607'] How would you like to be a fan of the Chargers right now? Oakland is Oakland... Denver is going the wrong direction... KC put all of their eggs in the basket of an unproven back-up (Cassell) who is now injured, and then they fire their OC less than 2 weeks before the season starts Seriously...is there another team that looks to have an easier road to their division title than the Chargers do right now? [/quote] Just wait. The Raiders will win that division this year and shock everyone.